I believe gratitude can bring joy to life in nearly every situation. Here are some simple ways to add the study of this important value into your family time any time of the year. 1. Share what you are grateful for over candlelight at dinner. Dinner is a great time to encourage gratitude/sharing about things we are thankful for. I shared about how we enjoy this practice in our family in a post over at Tips from a Typical Mom. You can find it here. 2. Make Thank You postcards. I love the idea of sending postcards to people you are thankful for. Read this post from The Good Long Road to get details. 3. Play the “What Would You Feel Without It” Game. This game can be done any time during the day, the more silly mood you are in probably the better. Simply ask the kids what would they feel like without various items. They will be surprised how different life would be without some of the things they consider “normal” to have. You may like to begin a discussion about how other people live without such items, if it is age appropriate, to help them remember to appreciate what is sometimes taken for granted in their life. 4. Make a Giving Thanks Jar. Dedicate a jar (decorate one, if you wish) and have little pieces of paper ready to write on beside it. You may want to make a routine of adding cards to the jar, or just let people add items as they wish, each with something you are grateful for. At a specified time, sit down with the family and read the cards together. I thought this was a cute version from That’s What Che Said. 5. Put together a Thankfulness Tree or a Gratitude Wreath. Create a large tree and cut out leaves. On the leaves write things you are thankful for. Thankfulness fills us up and reminds us how beautiful is, just like when we add leaves to the Thankfulness Tree. Add leaves to your tree for a few weeks. You can also make a 3D version. See this lovely post by Sparkle Stories for an idea. Or you can add leaves to a wreath instead. Here is a fun wreath project from Will Work for Eskimo Kisses. I posted a picture of our recent creation on Facebook. 6. Make a list of ways you are thankful for your family members. List each family member and three things you appreciate about them. Then write or draw a picture of one way you can show them how thankful you are. Share the list over a family meal so everyone can practice gratitude together. 7. Read books about gratitude and/or make your own Gratitude Book. There are so many wonderful children’s books about being thankful. 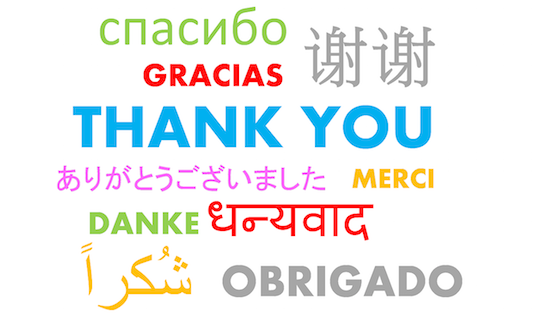 One of our favorites is The Secret of Saying Thanks. Sheila from Pennies of Time posted about this book in this article. After reading you can act out the story or ask your child to recount what they remembered about it. You may even like to make your own book, as well. 8. Draw and write what you are thankful for. Here are some simple printable prompt pages from Frugal Homeschool Family to do an art and writing activity with your little ones. 9. Make a collage using pictures of things you are grateful for. Let your child have the camera and take photos of all things they are grateful for. You may like to print out the pictures and then make a collage, or create a collage online (like in PicMonkey) and then print it for them. Most kids love the opportunity to use a camera! Simply get a notebook and add things you are grateful for. If you want to actually buy a journal meant for that purpose, check out this list of 6 different journals from Awesomely Awake. 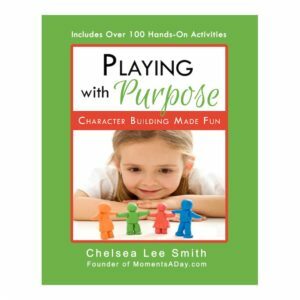 For more hands-on activities to teach kids about positive character traits, check out my ebook Playing with Purpose: Character Building Made Fun. 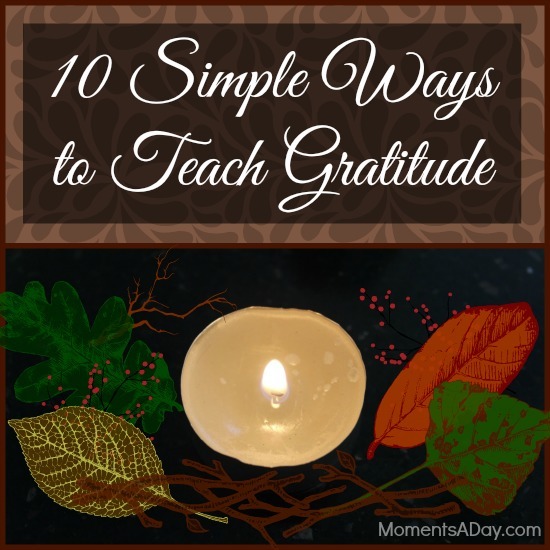 Do you know any other activities to teach gratitude? 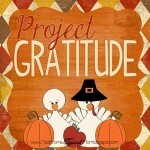 This year I participated in Project Gratitude hosted by Tips from a Typical Mom. For many more ideas and articles about families and gratitude, check out the Project Gratitude series. This post was originally published on Nov 22, 2013. These are great ideas. I’m trying to come up with a long list of gratitude ideas. Thanks for sharing! Do not make a child grateful, do not get irritated when he does not say thank you or does not notice your efforts. So you will awaken in him only a sense of guilt, the child will feel bad, because he does not feel grateful. And for this certainly will not tell you “thank you”, and in the future will do it “from under the stick.” What for to you such false pleasure? Better tell the child that when you feel grateful, it makes you happy. It’s nice to give thanks! Who wants to deprive themselves of the opportunity to be a little happier? “How would you feel without it ” is very appealing.It reminds them that whatever yhey have is not granted and makes them appreciate their belongings. Better tell the child that when you feel grateful, it makes you happy. It’s nice to give thanks! Who wants to deprive themselves of the opportunity to be a little happier?